While we love the Atlanta BeltLine and everything it’s doing for the city, it can be a stressful, obstacle-laden course to run. Between the strollers, the bikes, and the slow walkers, it’s hard to have a good run without running into people or jumping over long dog leashes on the 1.5-mile city trail. If you’re looking for a serene, early morning (or late afternoon) run, we’ve got you. Grab your headphones and water and head out to these beautiful trails. 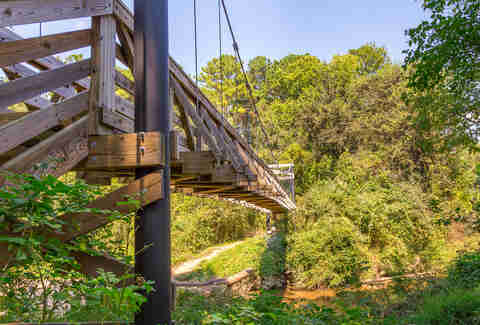 Far enough from the city that it will make you think you’re in the mountains, the Silver Comet Trail is paved and runs 61.5 continuous miles on abandoned railroad lines from Smyrna, GA to the Georgia/Alabama state line near Cedartown. 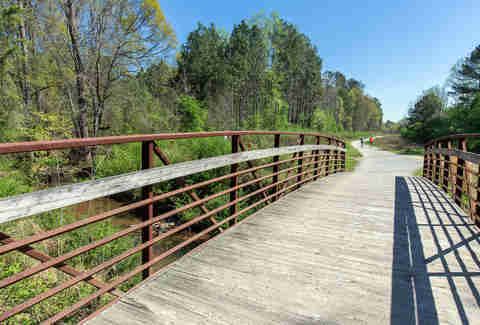 The trail is popular with cyclists and marathon runners alike, and you can jump on at mile 0 at the Silver Comet Trail Connector on South Cobb Drive near I-75. There’s ample free parking nearby at the Highland Station Shopping Center. And whether you’re planning to do a long or short run, you can plan it out on Silver Comet’s website. The heat in Atlanta doesn’t joke around, and the Chattahoochee River Trail has just the right combination of shade and scenery. Hop on the trail at Eugene Gunby Rd and run a 5k alongside the river. Once you’re done, find one of the few spots to jump in and cool off. The daily parking pass is only a couple bucks, and if you’re really digging the trail, pick up an annual parking pass for $35. Hidden between Midtown and Buckhead, the Morningside Nature Preserve feels like another world, a true hidden gem in the concrete city. While the trail is a bit short (a round trip is only 2.5 miles), the scenic route still offers side loops and creek crossings to add onto your run. The parking lot and main trail are off Lenox Rd, right in the city. 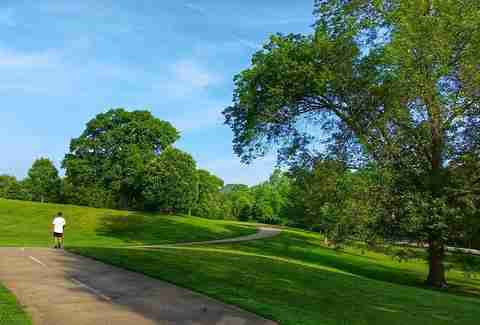 The Freedom Park PATH Trail connects you to some of the best neighborhoods in the city, in case you want to make a pit stop for a drink as a post-workout reward. You can access Downtown Atlanta, Inman Park, Old Fourth Ward, Candler Park, Poncey-Highland, Virginia-Highland, Little Five Points, and more. The city trail can be accessed by foot and has only a few street crossings -- mostly small streets -- for a safer run. If you want, you can combine this PATH trail with the BeltLine’s Eastside trail and Piedmont Park for a true city-wide run. Access the trail from Freedom Park or any of the nearby entrances. 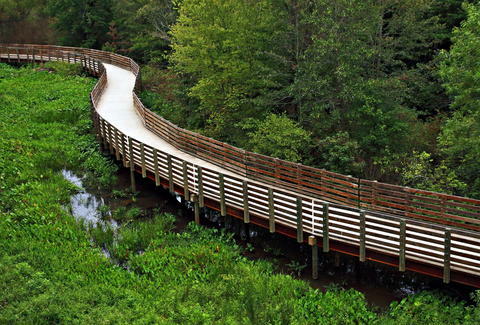 If you truly want to get outside of the city for a breath of fresh air and a good time, don’t miss the Suwanee Greenway Trail. The nearby wetlands are a fun sight as you run through, and be sure to check out all the unique flora and fauna in the area, including blue herons, snowy egrets, and red-shouldered hawks. 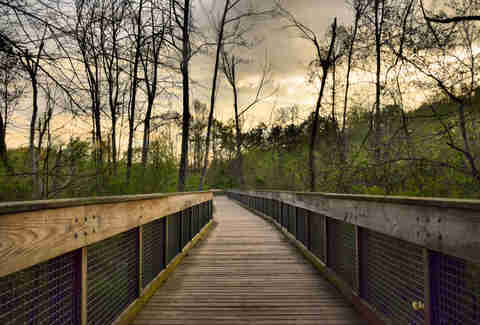 The trail is mostly paved and boardwalk-style; however, you can also take the more scenic dirt trail at the beginning. Start your run at Pierce Park and end at Suwanee Park for a nice 6-mile run. Parking is simple, and the end point -- Suwanee Creek Park -- has a nice 84-acre area with picnic tables and pavilions to help you cool off. Muriel Vega loves to write outside and sometimes makes herself run. Follow her at @murielvega.